Keeping up with the latest fashion trend is definitely not easy and sometimes it can be the perfect recipe for disaster (like the awful super skinny jeans with holes for men). That’s why I consider the timeless style a safe and perfect option for most guys. Scandinavian men should be an inspiration because they are always effortlessly stylish, and it’s all down to the timeless look. So today I am going to show you 5 must items for the perfect timeless wardrobe. Every man should have a pair chinos in his wardrobe. They are very versatile and can be used for a casual or smart style. 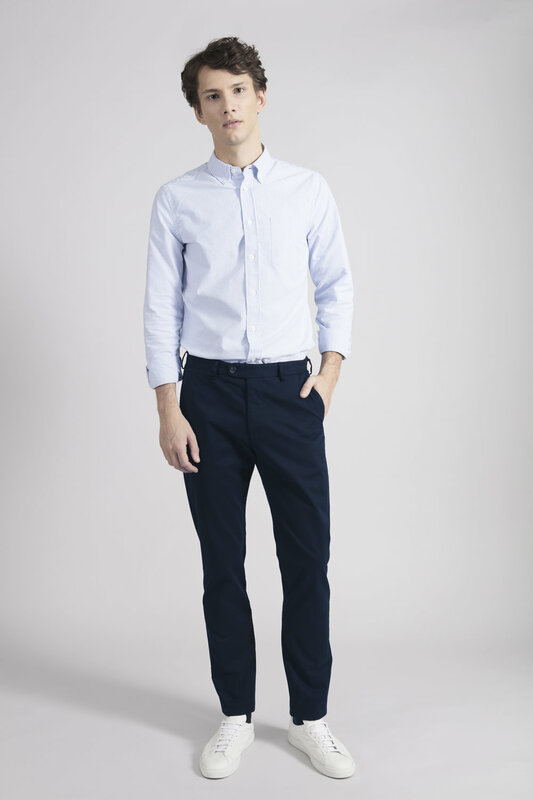 Navy chinos look great with a shirt, polo or t-shirt. You can buy a great pair of chinos from GAP, Asket and Massimo Dutti. A white t-shirt is an absolute must have in your timeless wardrobe. There are a lot of styles and fits, but my advice is to avoid the skinny or baggy style. Get a slightly fitted t-shirt for a more flattering look. A superior cotton is always a safe bet (Asket) and organic cotton is also very trendy right now (Muji). A grey t-shirt is also another perfect garment for your wardrobe. A shirt is always a stylish element of your wardrobe, and the Oxford Shirt is one of the best. It is really versatile and can be worn for a casual style, or for a smart day. As for the white t-shirt, forget the too skinny or too baggy (very 90's) fit and choose a slightly fitted style. The length of the arm is very important and the Oxford Shirt can be worn tucked inside your trousers or not. Here are some of my favourites. Asket The Oxford Shirt £80 available in other colours. For a complete timeless look you need a nice, comfy navy or grey hoodie. A hoodie is perfect for the cooler days of autumn. My advice: nothing with a big logo, keep it minimal and enjoy the timeless style! It looks great with a t-shirt or an Oxford shirt. To complete the perfect timeless look you will need a pair of white trainers. They are perfect with jeans and chinos. Here is a selection of my favourite ones. So there you have it! The 5 essential items for the perfect timeless wardrobe for men. What is your favourite one? Are you following the timeless style? See you soon with more fashion advice!